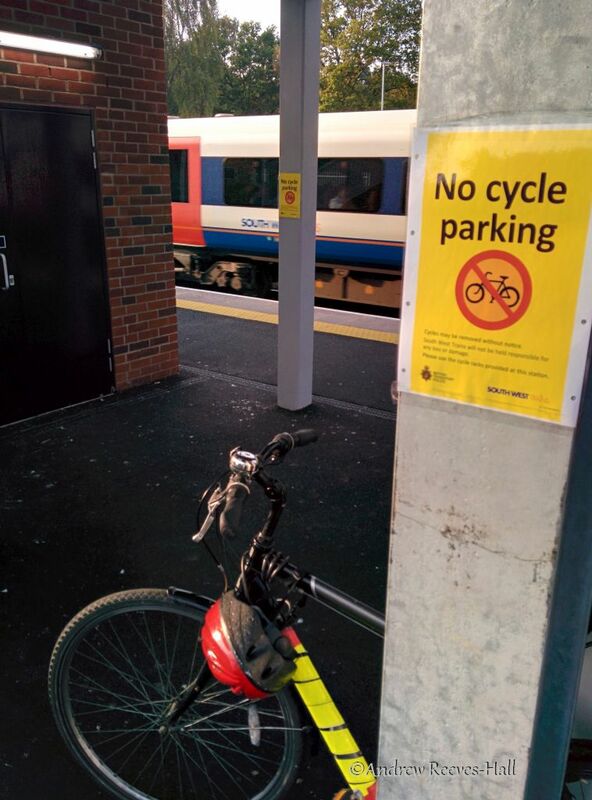 People are forced to lock their bicycles to whatever things they can because South West Trains has not provided enough parking facilities. Today marks the start of National Customer Service Week but you’d be forgiven for shaking your head at that after finding out how much South West Trains and Network Rail have let costs escalate and delays mount for their train station at Fleet, Hampshire. The cost to “revitalise” Fleet train station has mushroomed an incredible 48% to £8,871,000 from an original of £6,000,000 according to figures obtained through a Freedom of Information request – and work has not yet finished, nor will it be for possibly a further year and a half! The forecourt of Fleet station won’t be improved for possibly up to 1 and a half years! The FOI answer also revealed a significant delay to completing the Fleet station project itself: the forecourt “reconfiguration” work and additional cycle provision (presumably bicycle parking) is now not to be done until well into 2015, and possibly as late as 2016. In fact, South West Trains have not yet even replaced the secure cycle storage that they ripped out last year at Fleet station! And another surprise! The FOI answer says that it will be “Hampshire City Council” (sic) that will pay for the forecourt reconfiguration whilst the Department for Transport will be paying for the additional cycle provision and a waiting room. This condition is unlikely to be met because funding for an accessible forecourt is now delayed until the 2015/2016 fiscal year. The Fleet branch of CTC has also been busy campaigning for improvements to the station forecourt so that road danger is reduced and bicycle parking is increased. Please take a couple minutes now to fill in their “Fleet Cycling Survey“. 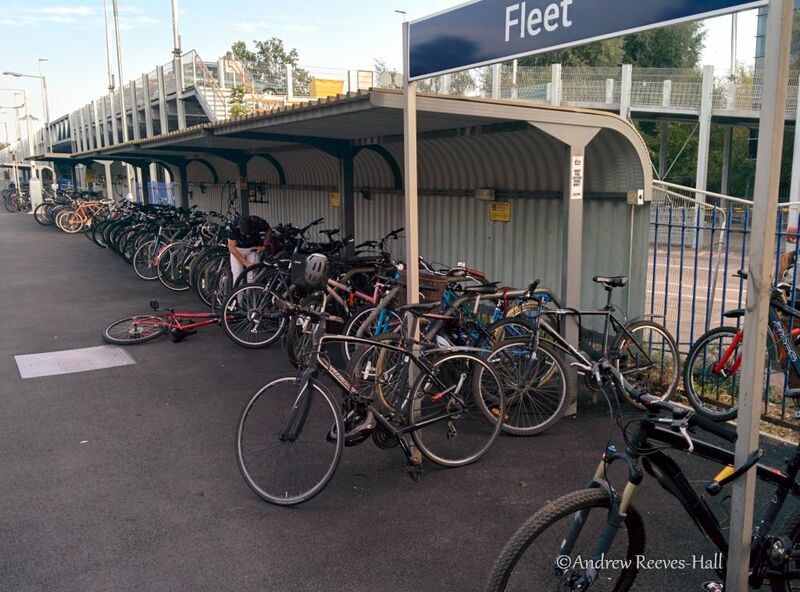 Andrew Johnston, chair of Fleet Cycling, stated last week on his blog (HERE) that he met with 3 managers of South West Trains to discuss the bicycle provision at the station. UPDATE: A count of bicycle spaces this afternoon found only 128 available (some were removed when the Works began). Well, there goes the National Customer Service Week nomination! And it’s looking increasingly difficult for South West Trains to follow-up on their “2013 Cycle-Rail Operator of the Year” award in this year’s Cycle-Rail gala later this month. The decision to keep the premium parking bays in the forecourt instead of providing a safer passage for people who choose to walk and cycle is a major disappointment. South West Trains and Network Rail should rightly be condemned for it. Although there’s just 74 designated spaces on platform 2 to park a bicycle, many more are chained to posts and railings. Cycling to the station is very popular: A twice-daily survey (at 9am then at 5pm) spanning a week in late September found an average of 158 bicycles parked on the platforms and in the forecourt. The least number of parked bicycles counted was 112 and the most was 184. Some people were seen taking folding bicycles on to and off of trains, which means even more people were cycling to the station. 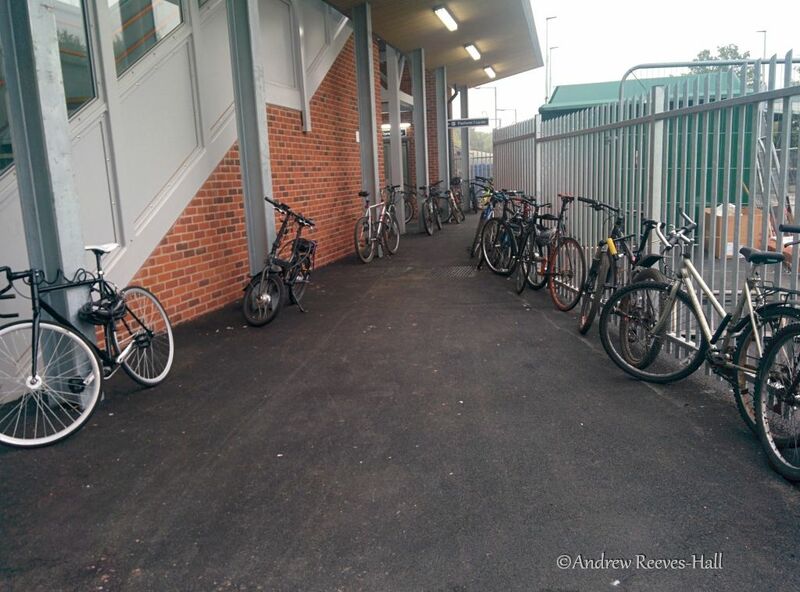 The thing is, Andrew Johnston of Fleet Cycling states there was just 138 spaces available before the Works began! 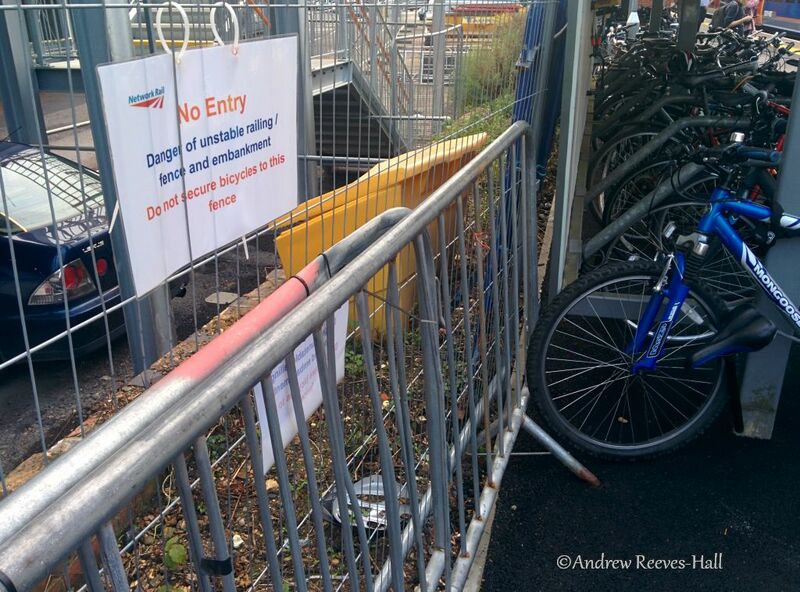 No wonder why there are bicycles chained up to fences all around the station! The South West Trains managers told CTC Fleet Cycling that they will have 210 bicycle spaces available once the works are complete (remember that could be in a year and a half’s time, in 2016!). That’s 76 additional bicycle parking spaces, then. Hold that thought. Now there is even fewer places to park a bicycle on the platform. Taxpayer money spent for people driving: £2,060,000 plus an additional £750,000 for a car-centric new forecourt in the years to come, for a total of £2,810,000. Now, what does that get us? Aside: there is a item in the FOI showing £450,000 (to be) spent on “One canopy/waiting room” which will permit some number of people – a dozen? just 8? – to wait for their train in an enclosed area. Work on platform 2 has been left unfinished and temporary fencing erected with signs telling of dangers and warning off would-be parking of bicycles. The figures obtained make no mention whatsoever of the £300,000 from Hart District Council that they supposedly agreed to pay as “partnership funding” back in December 2012. So, local taxpayer’s money was given over with a request to increase bicycle parking (which hasn’t been done) and South West Trains claims it has consulted with the council on how it is spending on the forecourt but defers implementation for up to a year and a half and then takes Hampshire County Council money as well! If I was a Councillor in Hants District Council or Hampshire County Council then I know I would probably be having a heart attack right about now! 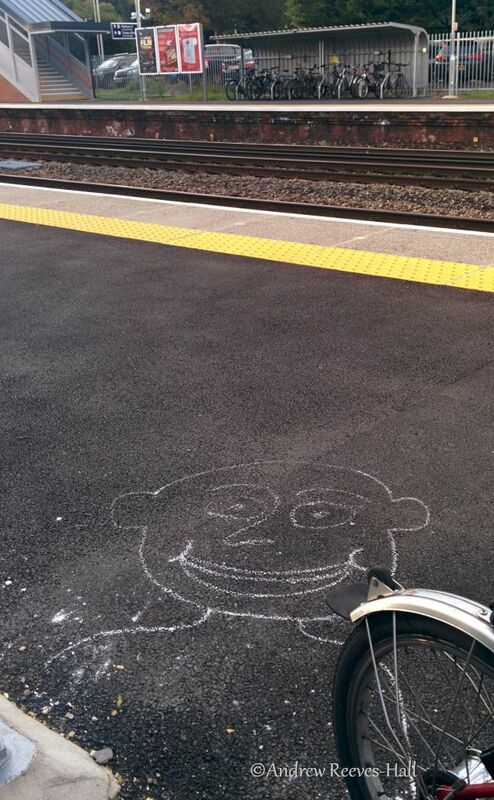 At least cycling does make one happy even if you’re left wanting at Fleet station! South West Trains stated on 26 September 2014 that work had just begun and that the entire project would take seven months ie to April 2014. In fact, the new footbridge opened 3 months later than that, in July. The “revitalised” station house was 4 months late, as it opened in August. The original forecourt remains as it was but with a vast increase in motor traffic: the new car deck created an additional 200 spaces for car parking. This means the road danger for people walking and cycling to Fleet station has increased, with no visible risk mitigation put in place by South West Trains, Network Rail, Hart District Council, Hampshire County Council, or the Department for Transport. In other words, we have been let down by every level of government! The situation now at Fleet station’s forecourt is critical, and it appears that South West Trains is content to let people who are driving, cycling, walking and taking public transit to fend for themselves in the forecourt for months – or even years – to come. 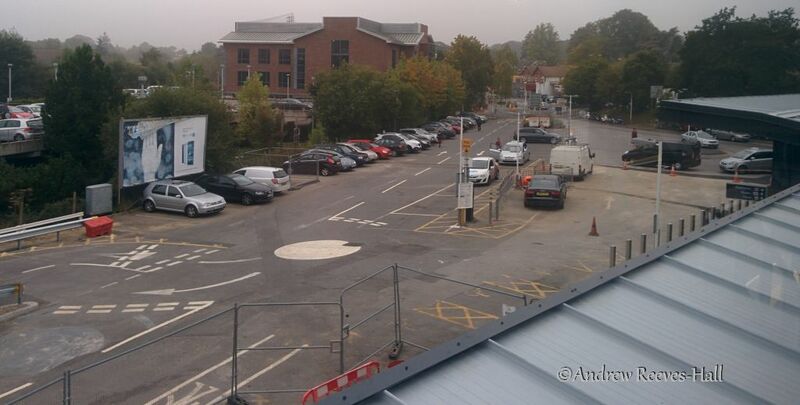 The local newspaper in Fleet picked up on the forecourt and parking saga with a front page article and photo on 28 August 2014 topped with the headline: “Cyclists ignored in station revamp“. Gosh knows what they’ll publish now! Maybe even Private Eye might start to take an interest, too! I’ve written to my MP, Tim Shoveller, MD of SW Trains and Hart Council about this. My bike is going rusty because of being chained to the railings of the foot bridge due to lack of cycle parking. It’s appalling. I will renew my efforts! The only way for change will be a mass barrage of complaints from all cyclists. Disgusted at SWT. The numbers involved are mind boggling, suspect people are becoming wealthy as a by product. Speaking of which: why is a car park, which presumably will generate revenue for SWT, being publicly funded? My local station (Chandler’s Ford) also has a car-centric forecourt despite the majority of people arriving and passing through on foot or by bike. The station forecourt has a ridiculously huge roundabout that is ignored by most users including the 100s of kids cycling from Toynbee school to its catchment area. And this station has plentiful free car parking that is mainly used by employees of the local industrial park businesses. It just does not make sense to drive to this station – if I’m dropping someone at the station, I’ll do so at a station where the trains actually go somewhere. There is not enough bike parking (recently always overflowing). I can see that, at some stations, it makes sense to splash out on car parking (e.g. Southampton Parkway, just off the M27). At most locations though, the other modes are much more important and these modes need to be nurtured with safe routes and plentiful safe bike storage. Also, wtf is premium parking? Keep up the good work Pedaller.